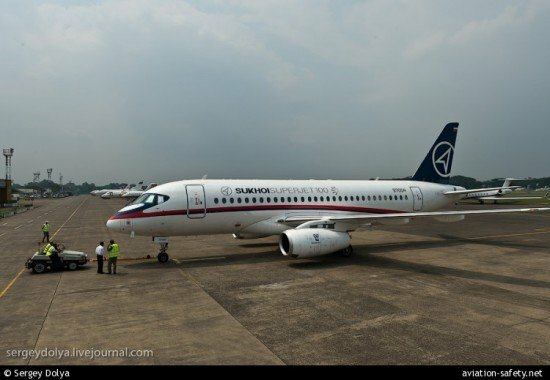 A preliminary report issued by the Indonesian National Transportation Safety Committee (NTSC) states that the Sukhoi Superjet that crashed on a demonstration flight near Jakarta, Indonesia, was cleared to fly below the Minimum Safe Altitude following a request by the crew. On May 9, 2012m, the Superjet flew into a near-vertical mountainside on the eastern side of Mount Salak at an elevation of 6,100 feet. All 45 on board were killed. Prior to the demonstration flight, an IFR flight plan was filed with a flight altitude of 10,000 feet and an estimated duration of 30 minutes. Some six minutes after takeoff from Jakarta-Halim Airport, the pilot contacted Jakarta Approach and requested for descend to 6,000 feet. The Jakarta Approach controller asked the pilot to repeat the request. The pilot repeated the request for descend to 6,000 feet. Subsequently, Jakarta Approach controller responded and acknowledged the request by replying ‘6,000 copied’ . The pilot replied: ‘Descend to 6,000 feet’. Two minutes later the pilot contacted Jakarta Approach controller to request for making right orbit. The Jakarta Approach controller approved the flight to make orbit to the right at 6,000 feet. The airplane struck Mount Salak in the process of performing the orbit. The AIP Indonesia indicated that Minimum Safe Altitude (MSA) for the area was 6,900 ft. The Enroute Chart Indonesia indicated that Minimum Off Route Altitude (MORA) for the planned flight route was 13,200 ft. The MORA applied to flights that are being performed outside of the published airway. The planned flight route itself for the Superjet was not a published airway.